Machel Montano (born 24 November 1974) is a Trinidadian soca singer, actor, record producer and songwriter. Montano is the front-man of the soca band The HD Family, and is noted for his high energy, fast-paced, and often unpredictable on-stage performances. In 1987 he was the youngest finalist to ever win the Caribbean Song Festival. His career spans more than 30 years. He now stands as one of the most well-known soca acts in the world, using his leverage as an artist able to sell out shows. Recently he has moved to the Los Angeles area and furthered his pursuit, saying: "I may not be the one to bring it forth, but in the meantime, I have a lot of work to do in order for something to happen." He is very well known in New York City, where he has had sold out concerts in Madison Square Garden many times over.Machel is a six time international Soca Monarch. Montano was born in Carenage (Northwestern Trinidad), and his family moved to Siparia, (Southwestern Trinidad), when he was very young. He attended Siparia Boys' R.C., then Presentation College, a prestigious secondary school in San Fernando, where he was in the choir led by Mrs Cynthia Lee-Mac. 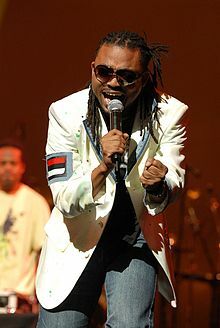 Machel first shot to fame as a nine-year-old boy with the song "Too Young To Soca" while he was still in primary school. In 1984, along with his older brother Marcus and neighbours, the group Pranasonic Express was started and, in 1989, the band became Xtatik. In April 1986, at the age of 11, Montano appeared on the mainstream television show Star Search. In 1987, he took part in the Trinidad and Tobago National Song Writers Festival, and placed second with his song "Dream Girl". He also won the Caribbean Song Festival in Barbados, becoming the first Trinidadian and youngest contestant to win this competition. The band developed and was re-invented by its leader Montano several times, including as The Xtatik Circus, Xtatik The Road Marching Band and The Band of the Year, as part of his Zen battle to keep his band and his performances fresh. 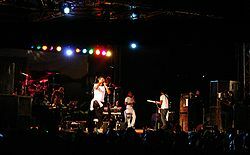 Since 2007 they have been known as Machel Montano HD (High Definition); Montano promotes the concept by saying that he is the first human being to go HD. He claims this characterizes the evolution of his music over the past 25 years and the highly improved style in which his music is presented to his fans in radio format, television, and during live performances. He is part of a campaign in Trinidad and Tobago to promote safe driving - "Arrive Alive". Part of the hype surrounding Montano since 2007 is his HD tour bus, a 20-year-old bus from the Public Transport Service Corporation (PTSC) that was re-done and includes a bedroom, bathroom facilities, flat-screen TVs, Internet access and expensive audio systems. After its debut in 2007, the bus was re-painted for 2008, the new images of Machel matching various photos from the album artwork of his 2008 CD, Flame On. The bus featured heavily in his videos for "Jumbie" (2007) and "Rollin/Blazin d Trail" (2008). In 2012 Montano won the Road March, Power Soca Monarch and the Groovy Soca Monarch, thanks in large part to his business and personal manager, James Walton. He won the Groovy Soca Monarch with his rendition of "Mr. Fete". In May 2012 he launched the music video to his hit single "Bottle Of Rum". Mr. Walton helped launch merchandise, collaborations and reality shows to help catapult Montano's career to new heights. The band includes foreign influences such as from its Venezuelan percussionist Ernesto Luis Gutierrez, Shawn Mitchell, bassist from Grenada and musicians from Barbados. Kernal Roberts, son of the late calypsonian Lord Kitchener, has taken up the role of Xtatik's drummer and musical director. Montano was instrumental in the promotion of soca music in the United Kingdom on the BBC's black music digital radio station BBC Radio 1Xtra, where he co-presented the International Sounds of Soca show for four years with DJ Slic. He has released many successful singles, with and without Xtatik, during his career, such as "Big Truck" (Xtatik's most successful single, which won the Road March title in 1997), "Outa Space" (with Beenie Man), "Music Farm" (Xtatik), "It's Carnival" (with Destra), and his more recent back-to-back Road March title wins: for 2006, "Band Of The Year" (with Patrice Roberts), and in 2007 "Jumbie". His album Flame On, released in February 2008, featured collaborations with some of the most esteemed artistes in calypso, such as David Rudder on "Oil and Music" and the Mighty Sparrow on "Congo Man". These two collaborations were well-received all around, especially "Congo Man". Flame On also includes Clamydia with other well-known artistes from various genres including soca, reggae, rap and reggaeton. Examples of these partnerships can be heard on the following tracks: Patrice Roberts on "Rollin", Shaggy on "Wining Season", Buju Banton on "Make Love" and finally Lil Jon and Pitbull on "Defense (The Anthem)". On Flame On Montano's right-hand man Kernal Roberts was involved in the writing of eight out of the 13 tracks. In Trinidad's Carnival Road March Competition for Carnival 2008, Montano's song "Blazin d Trail" placed third. On 20 January 2013 Montano released the official video for the single "The Fog" from his 16th solo album, "Machelements". On 27 January 2013, Machel then released another video for his single "Float". Two days after another visual was released for his song "Happiest Man Alive". Other songs that were followed by immediate visuals are "Epic", taking two months to create and release, and "Ministry of Road", taking less than one month to follow up on. Only in recent years has Montanol begun to take advantage of social media, using social media platforms such as Facebook, Instagram (machelmontano), My Space, YouTube and Twitter (@machelmontanohd). He has been able to expand and create music outside of his respected field by collaborating with various artists outside of the Soca Genre. One genre of music Montanol took interest in most recently (2014) is electric dance music (EDM). Collaborating with well-known EDM artists, Major Lazer and Diplo, the three artists created an original sounding EDM song with a Soca vibe, called "Sound Bang" (released 9 January 2014). In November 2014 Montano won a Soul Train Award for Best International Performance for the song "Ministry of Road (M.O.R.)". His win for "Ministry of Road" is the second consecutive win at the Soul Train Music Awards for Soca Music. The International Soca Monarch competition is an annual contest between various competing Soca artists. Within this competition there are two sub-categories which contestants can place in. One of which is the Power Soca Monarch; a competition for upbeat songs while the International Groovy Soca Monarch is for Soca songs of a slower tempo. In 2011, Montano won his first Soca Monarch competition (from Power Soca Monarchs) for his performance of the song "Advantage". In the years 2012 and 2013, he won back to back times in both sub-categories for his performance of his songs "Pump Yuh Flag" and "Mr. Fete", in 2012 and, "Float" and, "The Fog", in 2013, winning TT$2 Million each time. He also won the Power Soca Monarch in 2014 for his song "Ministry of Road", however he was dethroned by Kerwin Du Bois and his hit song "Too Real" in the Groovy Soca Monarch category. Montano set a new record by winning the 2014 Power Monarch, becoming the first artist/ performer to win a total of four titles. He won the title again in 2015 with his hit song "Like Ah Boss". Patrice Roberts (left) and Machel perform at UWI Splash in Chaguaramas, Trinidad. ^ Thompson, Dave (2002), Reggae & Caribbean Music, Backbeat Books, ISBN 0-87930-655-6, pp. 300–301. ^ "Machel Montano Heart & Soul - He opens up on children, women, life and music", Trinidad Express Newspapers, 2 March 2012. ^ Wayne Bowman, "Machel for Radio City", Trinidad express Newspapers, 6 February 2011. ^ Bobie-lee Dixon, "Machel Montano Soca Monarch Artiste of the Week", Trinidad and Tobago Guardian Online, 11 January 2012. ^ New York Amsterdam News, Vol. 98, Issue 39, 20 September 2007, pp. 24–25. ^ "FADER Five: Machel Montano's Wining-Worthy Soca Jams". The FADER. Retrieved 27 February 2019. ^ a b "Machel Montano". ^ "An exclusive interview with soca star Machel Montano". Retrieved 4 January 2014. ^ Montano, Machel. "Montano Bio". Machel Montano. Archived from the original on 27 February 2014. Retrieved 4 January 2014. ^ "1Xtra announces August 2004 activity" (press release), BBC, 8 July 2004. ^ D., Bonn (3 January 2014). "Machel Sets New Record". Trinidad Express. Retrieved 4 March 2014. ^ "Machel Montano retains Power Soca Monarch title", Jamaica Observer, 14 February 2015. Retrieved 15 February 2015. Machel Montano Performs at Miami Broward Carnival 2012. This page was last edited on 20 April 2019, at 18:36 (UTC).